When I compiled the UK Vegan 100, I only added “Bought pizza with vegan cheese in this country” for a laugh. I’d never even heard a sniff of it, and it made me so cross that all across America people were angrily blogging that they could only get 2 types of vegan cheese from their local pizza places. You poor things. Not long ago though I was inspired to see JoJo’s post about pizza with vegan cheese in Brighton, then lo and behold I read about Dough in Manchester which also offers vegan cheese! And on a sunny Sunday over the bank holiday weekend I found myself in Manchester with a newly vegan friend and we decided to find Dough. I must confess that we’d had rather a lot to drink by the time we found it (and it certainly went downhill afterwards). So we kept confusing ourselves by the fact that lots of the meaty options were labelled as available dairy free, but they’re obviously catering for allergies as much as vegans. I went for the Sicillione and my friend had the vegetarian deluxe. I’m fairly confident it was Cheezly mozzarella and one of the reasons I can tell is that you can hardly see the cheese. I always add my Cheezly just before the end otherwise it has a tendency to overmelt. But it tasted a bit more like Tofutti. If I’d have been more sober thoughtful I’d have asked. Anyway, although I’d have preferred my aubergine a bit more cooked, the pizzas were pretty good and although I don’t mind cheese free pizzas it was very good to have a dairy free option for a change. I will be back for sure. And now that’s 2 places in Britain that offer vegan cheese on their pizza – does anyone know of any others? As the great Bob Dylan once said – Oh the times, they are a changing. If it makes you feel any better, there’s no place in Memphis that offers vegan cheese pizza. I always order cheese-less roasted veggie pizzas when I go out and I add Daiya to the leftovers when I take it home. I did have a delicious hummus pizza over the weekend at a cute little pizza joint. Glad you liked Dough. It was me who mentioned it on Jo Jo’s post. There’s also Cornerhouse, Odd and Odder in Manchester who offer a specific vegan pizza, without cheese though. I have asked them in Dough what cheese they used and the member of staff said that they didn’t know the name but that they ordered it from Scotland. Bute Island (Scheese) are Scottish but I’m not aware of them doing a melty cheese though? 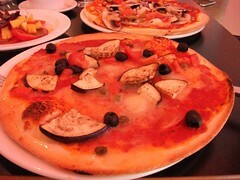 Nice pizza! Looks really nice! That’s great that you found vegan cheese pizza in the UK! 🙂 I’ve never been able to get a dairy-free cheese in a restaurant, either. Fortunately, I love my cheese-free pizzas just as much, but it’s nice to see other options. Odder, opposite the BBC in Manchester also does a vegan Pizza, with ‘cheese’. I went with a vegan friend and shared ne, and it was so good we bought another. I would say though that vegan pizzas sampled in Melbourne, Australia without any attempt at cheese were far far better.